I first encountered Marlon Peterson as I hastily scrolled down my Facebook news feed. His image stood out in stark contrast against the viral shares and “woe betide my life” statuses. Set against a snow-filled urban backdrop, Peterson stares at the camera with his bare arm displayed. Peterson’s story, all 191 words of it, has been liked on Facebook by 757,059 people to date and shared by 38,468 others. All those numbers, all those people sat behind a screen – influenced by his life, and I was one of them. Who was this man that, while incarcerated for a substantial period of his life, had also played such an active role in the lives of students at Mott Hall Bridges Academy in Brooklyn? “I grew up in a mostly stable home with two parents and two older siblings. My father was very religious as a Jehovah’s Witness and my mom was not. They often battled about the best way to raise us, but for the most part things were stable in comparison to our neighbourhood and building, which was crack infested. Gunshots and murders were normal. The 1980s in Crown Heights, Brooklyn, was tough,” Peterson tells me of his childhood. When the police came knocking at the door in 1999, his family “were horrified and in disbelief.” In 1999 and at 19 years of age, Peterson was sentenced to 12 years in a maximum-security prison, arrested and charged with first-degree murder, several counts of attempted murder, attempted robbery and several counts of criminal use of a weapon. Terrence Wells, 22, and Lerone Grant, 23, were the alleged gunmen; Patrick Fulton, 21, was on lookout with Peterson, and Akini Furlonge, 21, allegedly drove the grey Ford getaway car. Shot dead was Gary Crissey, the co-owner of the Connecticut Muffin store in which the botched robbery for $10,000 took place, and Jimmy Brown, the shop’s manager. Another employee and a customer were also injured in the shooting, while undercover police officers faced gunfire spray as Wells and Grant made their escape. The students that Peterson began communicating with at Mott Hall Bridges Academy in Brownsville know only too well the value of such wisdom. 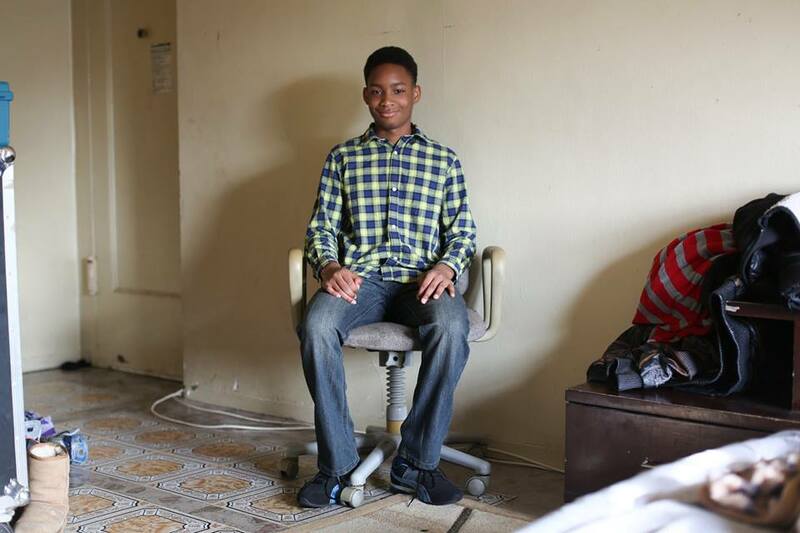 As 13-year-old Vidal Chastanet told Humans of New York when he was photographed for the Facebook page, “When you live here, you don't have too many fears. You've seen pretty much everything that life can throw at you. When I was nine, I saw a guy get pushed off the roof of that building right there." Mott Hall Bridges Academy, which captured the world’s attention from the subsequent campaign that Humans of New York kick-started, knows this too about the students they teach. As Chastanet explained, "When we get in trouble, [our head teacher, Ms. Lopez] doesn't suspend us. She calls us to her office and explains to us how society was built down around us. And she tells us that each time somebody fails out of school, a new jail cell gets built. And one time she made every student stand up, one at a time, and she told each one of us that we matter." Peterson aimed to show this to the students too, but not without a dose of reality poured in, highlighting how fine the line was that they were treading in such a community when crime walked hand-in-hand with everyday living. As Victor Hugo once said, “He who opens a school door, closes a prison.” The key was to show the students how to change, even if that meant discussing life in all its complexities, so they could avoid hearing the clang of the jail cell closing. but I will always be beautiful. As Peterson tells me, “The program lasted for two school years. I still have every single original letter from the correspondence. If I had to estimate, I must have written 50-75 students 3-4 times each… The communication gave me a sense of relevancy. It pushed me to be a leader within the prison as an educator, program developer and class facilitator. It pushed me to go and earn my associates degree while in prison. It literally shifted my trajectory…. I find the name of Peterson’s organisation ironic, in so many ways, when I read the quote from Nelson Mandela - “In my country, we go to prison first and then become president.” In order to execute change, those behind it must understand the problems from the intricacies of the roots upwards to the branches and the leaves. They must realise why these problems actually occur. Peterson talks from experience. He knows how this works, and writing letters with students such as those at Mott Hall Bridges Academy – intercepting their minds at an early age - is one way of reducing violent crime and repetitions of history. Another is through talking and learning – and by bringing those who have offended back into the community, rather than ostracising them, and through helping them effect change as part of their rehabilitation.